By the late 1980’s, Formula One had thoroughly established itself as the absolute pinnacle of motorsport. Through constant development and exceedingly high budgets, the sport had found itself at the forefront of technological development. Unfortunately this relentless pace forward was having some negative side-effects, as the ferocious pace of the turbocharged monsters was steadily spiraling out of control. Additionally, the smaller teams were having a hard time coping with the amount of money being thrown around on the top. In an effort to bring the speeds down, simplify the cars and more importantly bring costs down, the FIA introduced a new 3.5L naturally aspirated engine formula for 1989. The move opened the door for lesser F3000 teams and other totally inexperienced cash-strapped hopefuls to enter the sport, as the engines were far less complex and much cheaper to run. The fiery turbo cars were becoming too fast and too powerful for their own good. The move turned out to be a resounding success, as tiny teams started sprouting up left and right. As a testament to the new engine’s success, F1 now found itself preoccupied with pre-qualifying sessions to weed out the many truly dreadful cars not good enough for the 26-car grid.Unlike the years before, the technical regulations remained remarkably stable for a number of years, until the horrendous fatal accidents of Simtek-driver Roland Ratzenberger and three time World Champion Ayrton Senna. The tragic weekend reignited concerns about the speed of the cars, causing the FIA to introduce numerous new features intended to slow the cars down and increase safety for 1995. This included smaller wings and raised ride height to decrease downforce, higher cockpit sides and bigger cockpit openings, stricter side-impact tests and longer chassis to protect the driver, and a reduction in engine displacement to 3.0L in an attempt to decrease horsepower. In the immediate aftermath of the 1994 San Marino Grand Prix, the fear of further accidents was so great the FIA used amateuristic tire barriers on high speed sections of track, and even had the teams cut holes in the airboxes of their cars to starve the engines. On the European scene, Dome had made a name for itself with striking endurance prototypes like this Zero RL. It was in this troubled environment that a Japanese racing engineering firm by the name of Dome decided to join the sport. Dome was the brainchild of brothers Minoru and Shoichi Hayashi, who started building their own racing cars in 1965. Ten years later, their own design company had become a reality. Just three years went by before Dome presented the first real attempt at a Japanese supercar with the Nissan L28-powered Zero concept car. The sky seemed to be the limit, as the company moved to participate in the prestigious 24 Hours of Le Mans with the Cosworth DFV-powered Zero RL the year after. Back home, the company scored its first major success by winning the 1981 All Japan Formula Three Championship with Osamu Nakako and the Dome 320. A second title followed in 1984 with Shuji Hyodo, before the team moved into Japanese Formula 3000 in 1987, initially running customer March chassis. It wasn’t long before Dome produced its own chassis however, which saw Italian Marco Apicella score the 1994 title with the F104. With the Japanese F3000 title in pocket, the only way was up for Dome. This sentiment was echoed by new arrival Tadashi Sasaki, who moved to Dome from a position as team manager with the eternally backmarking Minardi team. Sasaki was eager to ride the company’s current wave of success all the way to the top, and instigated the firm’s first ever Formula One project. His dream was to field an all-Japanese Formula One team, something which had not been seen since Honda’s departure from the sport in 1968. Sasaki’s existing connections to the very close-minded world of Formula One paid dividends, as he was able to secure numerous vital parts for the new car. Among other things, it made him able to secure the use of the magnesium Xtrac 6-speed sequential gearbox which Minardi had used during 1995, along with its associated hydraulic system. For the design of the car itself, Dome turned to its sister company Jiotto Design, which possessed a 1/4th scale windtunnel, computer-aided design and manufacturing technology, and several autoclaves which the company could use to construct an intricate carbon fiber monocoque chassis. F104 designer Akiyoshi Uko was given the honor of penning the company’s first ever F1-machine. The Mugen-Honda MF-301H V10 promised respectable mid-field performance. Throughout the years, Dome had kept a strong connection with Honda tuning firm Mugen, which supplied all of their F3 and F3000 engines. The successful collaboration in these lower categories ensured Dome would be able to obtain the 1995-spec Mugen-Honda MF-301H 3.0L V10 as used by Ligier that season. At 670 horsepower, this was a very competitive engine for a startup team. By comparison, the Cosworth ED V8 used by most backmarkers could only muster about 630 horsepower, while the Yamaha OX11C V10 and the Hart 830 V8 were slightly more powerful than the Mugen-Honda, but far less reliable. Naturally the engine wasn’t able to compete with the Mercedes-Benz FO110 V10 (700 horsepower), Ferrari Tipo 044 V12 (700 horsepower) or the Renault RS7 V10 (750 horsepower), but the available grunt was more than enough to confidently settle in the mid-field. With the car’s debut slated for 1997 though, the team couldn’t afford to sit still, as the rest of the field would relentlessly move forward in the quest for power. With the engine situation under control, Dome focused on designing a car around it. Like all F1-cars since the late-1980’s, the new F105i used a carbon fiber monocoque chassis. Suspension consisted of double wishbones on all four corners, featuring pushrods which activated dampers supplied by Japanese firm Showa. Keeping with the domestic theme, the 11-inch (front) and 14-inch (rear) magnesium wheels were supplied by RAYS. The one area where Dome could not employ Japanese parts was tires. No domestic firm was in the business of making F1-spec rubber, which necessitated a deal with American manufacturer Goodyear. Initially the firm was a tad paranoid about the all-Japanese squad’s request, as rival firm Bridgestone was preparing to enter the sport in 1997. Goodyear’s officials suspected Dome was operating on orders of their Japanese rivals to obtain data from Goodyear’s offerings. The F105i's aero package simply followed the trends of the time. Luckily, Tadashi Sasaki managed to convince the wary Americans that no foul play was involved by flying over to 1995 Australian Grand Prix at Adelaide to meet with Goodyear representatives personally. With the crisis averted, the team received a batch of brand new Goodyear Eagle rubber. Aerodynamically the F105i was very conventional, utilizing the same features seen on any other car of the time, such as the winglets mounted to the sidepods with fins connecting to the rear wing. 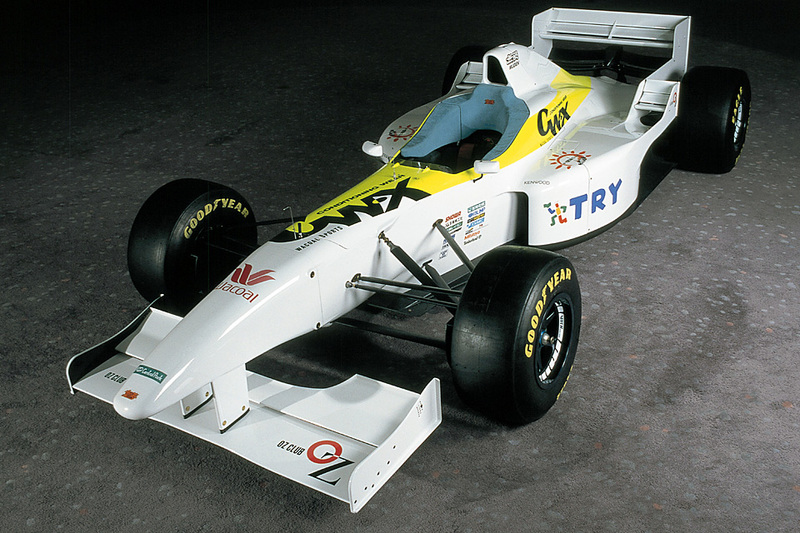 Safety regulations had become even more strict for 1996 though, which forced Dome to include even higher cockpit sides, and make the front wing endplates thinner to prevent them causing punctures. In all the car weighed just 510 kg (1124 lbs) With the driver included, it could reach the minimum weight of 595 kg (1311 lbs) with minimal ballast. Work on the car was completed on March 17, 1996, and the F105i made its public debut at the Spiral Building in the heart of Tokyo the day after. Dome named 1994 Japanese F3000 Champion Marco Apicella, 1990 All-Japan Formula Three Champion Naoki Hattori and Honda development driver and Dome F3000 competitor Shinji Nakano as the team’s drivers. Of the three men, only Apicella and Hattori had any sort of experience with Formula One, although this was extremely limited in both cases. Marco Apicella had been given a drive with Jordan at the 1993 Italian Grand Prix, but his performance famously lasted only 800 meters after he was collected by an unruly JJ Lehto at the first chicane. He would never get a drive again. 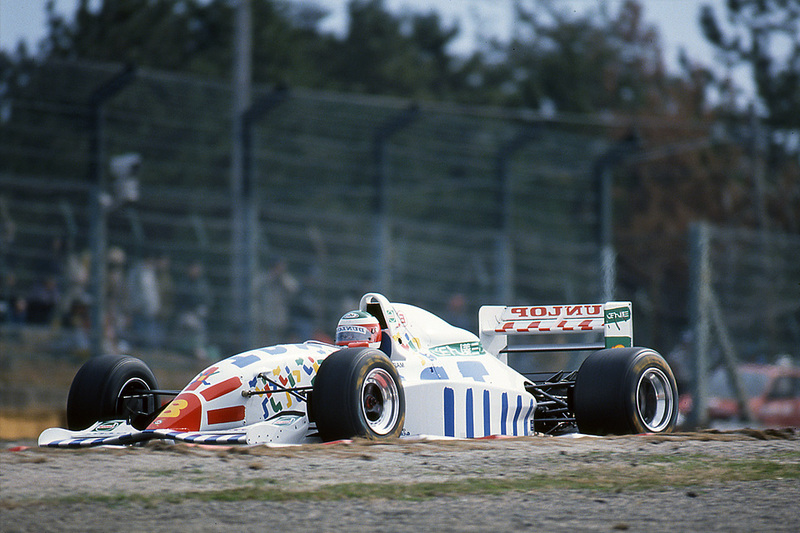 Naoki Hattori on the other hand had tried to pre-qualify the shockingly bad Coloni C4 on two occasions in 1991 at Suzuka and Adelaide, but understandably failed to do so. Official testing began in the spring of 1996, with Shinji Nakano clocking the car’s first kilometers on the tight and technical 3.3 kilometer Mine Circuit. Marco Apicella took over from there, and the team traveled to Suzuka for another series of tests. By this time the engine had reached the end of its operational life with 550 km on the clock, and it was subsequently replaced by a new Mugen-Honda unit. That May, the F105 passed the 900 kilometer mark, and Dome’s engineers had been able to establish a basic setup for the car. Marco Apicella was less than enthused however, as he complained of understeer on turn-in, oversteer on exit and frighteningly spongy feedback from the brakes. Aerodynamically the car was very twitchy and unstable, further compounding the handling problems. It was clear a lot of work still needed to be done to bring the Dome up to speed. Fortunately more testing and fine-tuning lessened the handling problems to a decent degree, and the project seemed to be going swimmingly for the moment. Marco Apicella testing the F105, Suzuka 1996. One thing which continued to bug the Dome squad however, was their ex-Minardi Xtrac gearbox. The unit’s magnesium casing proved to be unfit for the job, which lead to several small oil leaks. Because of this, one unimpressed sponsor started referring to the car as the “Doomed“. Sadly this sponsor would later proven to be right, as one final oil leak nearly killed the project single-handedly. During a Suzuka test, hot oil from the gearbox reached the even hotter exhaust, and the car was quickly engulfed in flames. Luckily nobody was harmed in the resultant inferno, but the one and only F105i chassis was badly burnt in the process. The fire represented a major setback for Dome, and sponsors were walking away from the project. In light of the team’s testing performances, no other companies were willing to join Dome in their F1-quest. With little in the way of funding, a 1997 participation was becoming ever more unlikely. 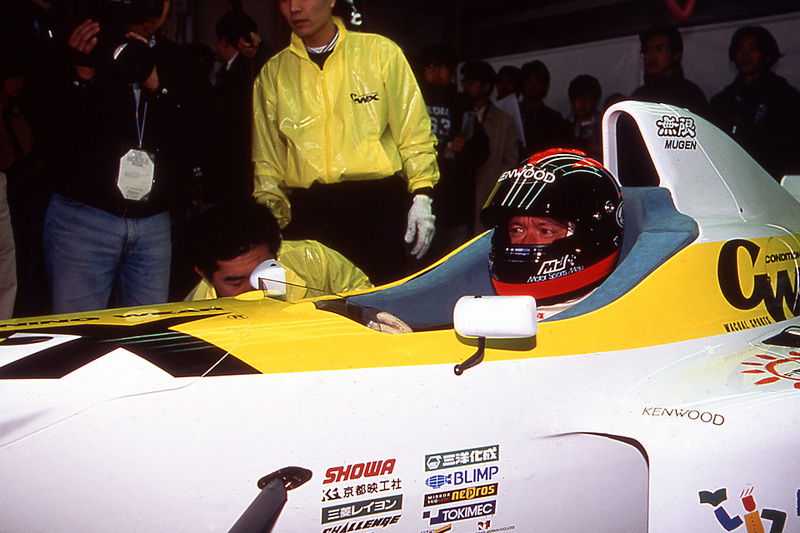 The dream of an all-Japanese F1 effort was rapidly falling apart. Prince Malik Ado Ibrahim (right) with ITV F1-reporter Martin Brundle and boxing legend Frank Bruno (center). In their desperation, Minoru Hayashi and Tadashi Sasaki started seeking out foreign parties to salvage the project. This lead them to Nigerian Prince Malik Ado Ibrahim, who was keen to invest his seemingly vast fortune in the world of Formula One. Sasaki arranged a meeting with the esteemed Prince in the Heathrow Hilton hotel, hoping to find the funding to at least keep the prospect of an future participation alive. By then the F105i had already become obsolete, as the new for 1998 regulations stipulated a narrower track (down from 2m to 1.8m) and grooved tires to further slow the cars down. The F105i's fate had already been decided by another FIA-rule change. While looking for a suitable room at the Hilton, Sasaki inadvertently stumbled into the preparations for an official FIA meeting coincidentally held on the very same day. Suddenly he found himself face to face with Patrick Head, chief engineer of the multiple World Championship-winning Williams team. “Hello! How are you?“, Head greeted him warmly, but Sasaki was quick to explain he was there for another meeting. This prompted Scotsman Tom Walkinshaw, head of TWR Arrows, to walk over and cheerfully proclaim: “Oh, Honda! Don’t say you’re in a different meeting. You will find our meeting is much more fun!“ Since the Dome project was still highly secret outside of Japan, Sasaki had to make a hasty retreat to avoid further questions, leaving his two impromptu hosts scratching their heads in bewilderment. Tom Walkinshaw (left) and Patrick Head jovially welcomed Tadashi Sasaki to the FIA-meeting. After the initial mishap, Sasaki finally met Prince Malik to discuss the future of Dome F1. The Nigerian was less than understanding about the team’s current predicament, and wanted to enter Formula One as soon as 1999. Tadashi Sasaki explained to him the engine deal with Mugen-Honda was still on loose screws, and urged him to come along to Honda in Japan to negotiate a definitive contract. The Prince agreed to accompany Sasaki, and once there talks with Honda were generally positive. What neither of the men knew however, was that Honda was orchestrating a return to Formula One for itself. Honda Racing Development was already deep into the preparations of a full works effort for 2000, as it was busy testing the new RA099 with veteran Jos Verstappen. Reverting to an underpowered Cosworth or secondhand Renault (Supertec) engine was simply not an option for Dome, so the end seemed near. 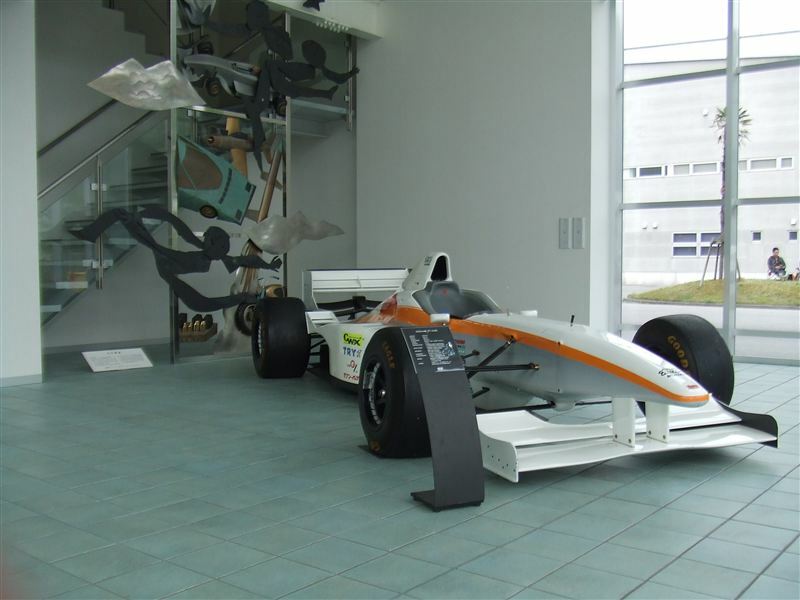 The F105i on display at Dome's headquarters. With the engine deal failing to materialize, Prince Malik Ado Ibrahim lost interest. He eventually turned his attention to Tom Walkinshaw’s Arrows team, which he sponsored through a completely unknown company which represented and produced exactly nothing. For Dome’s F1-aspirations it was the final straw, as a by now complete lack of funding prevented the proposed 1998-spec F106 from being created. Without the necessary yens or engines to continue, Minoru Hayashi pulled the plug on the ambitious project, and the F105i was relegated to a darkened room underneath the company windtunnel. The Dome F105i represented the life-long dream of Minoru Hayashi and Tadashi Sasaki to run an all-Japanese Formula One-team. Sadly a series of reliability problems lead to complete apathy from potential Japanese investors, and the project slowly bled out. A last-ditch attempt to reach out to foreign parties proved to be in vain, as only an over-eager Nigerian prince took the team seriously. Unfortunately for Dome, it tried to negotiate an engine deal with Honda just as the Japanese automotive giant was putting its own interests first. As a result the team had nowhere to go, and the Formula One project never got off the ground in earnest. In the end, the sport would not see another fully Japanese effort until Honda’s belated re-entry in 2006.